I am a cook. This means I kicked it up a notch! At the bottom of this post I list the original ingredients to the “Ham and Biscuit Breakfast Casserole” recipe. Preheat the oven to 350 degrees F. Grease the bottom and sides of a 9×13 baking dish (I used a glass 10×10 baking dish, and coated with non-stick cooking spray). Fully cook the sausage and drain. Set aside for 5 minutes to cool. Mix all the ingredients together, including the sausage, except for the biscuits and 1/4 cup of the shredded cheese. Stir to mix well. Cut each biscuit into quarters and add to the rest of the ingredients. Top with 1/4 cup shredded cheese. Pour everything into the greased baking dish. Bake for 35-40 minutes (or until browned and biscuit and eggs have cooked thoroughly). Allow to cool for 5 minutes. Cut and serve. Top with salsa to taste. The original Ham and Biscuit Break Casserole recipe included 1/2 cup whole milk (I substituted buttermilk), 2 cups cubed ham, and salt and pepper to taste. The original recipe also listed the cook time at 25 minutes. The top of the casserole may brown before it cooks thoroughly. In this case, cover the casserole with foil to prevent further browning. *I used 1/2 can of Mexican tomatoes, and froze the 2nd half in a freezer bag for future use. 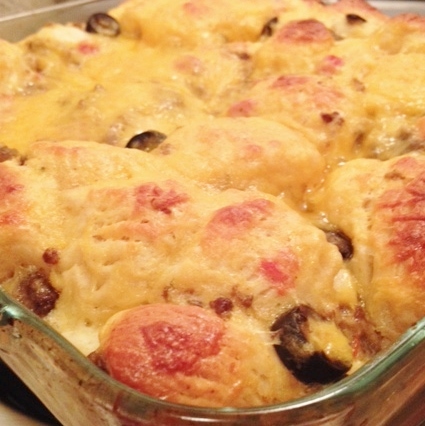 This casserole is great for dinner, and we enjoyed it as left-overs for breakfast. Heat individual servings in the microwave for 10-15 seconds, or until warm.